Spring is here and there is a lot going on in Town. You will find reports and information on a whole host of things that are happening in this issue of the Bulletin. As always, please contact my office, a member of the Board of Selectmen, or any of our Departments if you have any questions or concerns on anything that is going on as far as Town operations. Buildings and Facilities Manager Chris Andrews has been working on the following projects at various Town buildings. The Building is undergoing a building use assessment conducted by H.L. Turner. The employees in the building have completed a needs survey and the consultant will be providing recommendations to the Board of Selectmen for consideration. The roof of the Building underwent minor repairs from damage caused by the recent wind storms. The rear stairs to the upper parking lot will be resurfaced soon. New, Energy efficient LED lights have been installed. Working with the efficiency people at Unitil, the Town was able to receive a 50% rebate of the project costs. The roof over exterior basement stairs will be re-roofed and a list of upgrades to meet ADA requirements will be finished up. The roof needs to be replaced and assessing for other damage to be repaired. Plans call for an electrical upgrade at the park to allow for better lighting and power supply. With the snow gone, the crew has jumped right into Spring Cleanup mode. Our list of tasks is many. 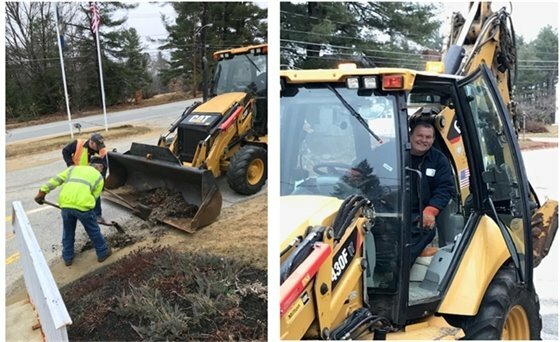 We have been cleaning up all of the Town’s facilities, including sweeping parking lots, bark mulching garden beds; cleaning and prepping of the cemeteries; getting the Town’s athletic fields and playgrounds ready for another season; and a whole bunch more. The Department is in the process of converting our trucks and equipment from winter mode to summer mode. This includes pulling off all of the sanding equipment, giving them a good cleaning inside and out, taking care of maintenance items and performing any repairs that need to be made to get ready for construction season. It is anticipated that the posted weight restrictions on certain Town roads will be lifted on Monday, April 15. This all depends on Mother Nature and whether or not we get an excessive amount of rain that will require us to keep the restrictions on a bit longer. Thank you all for your patience and understanding over the winter plowing season. We are here for you..
Join us for our Annual Easter Egg Hunt on Saturday, April 13, 2019. The festivities will begin with the Bow Men’s Club Annual Easter Breakfast. Breakfast will be held from 8:30 a.m. - 9:45 a.m. at the Bow Elementary School Cafeteria. The fee is $8.00 for adults, $4.00 for children. The Easter Bunny and our mascot Bowgie will be at the breakfast to visit with the children. The Egg Hunt will start promptly at 10:00 a.m. at the Bow Elementary School Field for children in 4th grade and younger. You don’t want to be late! Bring a bag or basket to collect your eggs. The skating pond is closed for the season. 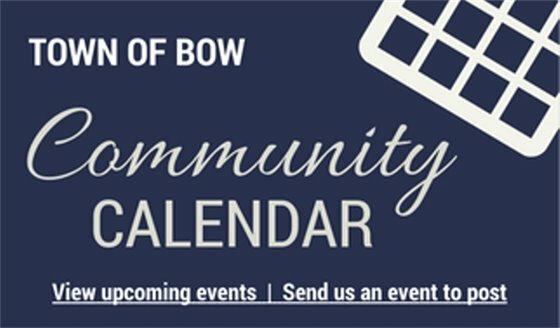 Check out our Face Book Page ”Bow Parks & Recreation” This page is updated regularly to keep you informed of Parks & Recreation Happenings here in Bow. If a dog is "at large," which means it is off the premises of the owner or keeper and not under the control of any person by means of personal presence and attention as will reasonably control the conduct of such dog, unless accompanied by the owner or custodian. If it barks for sustained periods of more than 1/2 hour, or during the night hours so as to disturb the peace and quiet of a neighborhood or area. If any female dog in season (heat) is permitted to run at large or be off the premises of the owner or keeper during this period except when being exercised on a leash by a responsible adult. At all other times such dog shall be confined within a building or enclosure in such manner that she will not come in contact (except for intentional breeding purposes) with a male dog. If, whether alone or in a pack with other dogs, it bites, attacks, or preys on game animals, domestic animals, fowl or human beings. If the skin of a person has been punctured by a dog and the incident was reported, including the identity of the dog and its owner, to the Police, or to the town clerk, such Officer or clerk shall, within 24 hours, notify the injured person, or, in the case of a minor, the minor's parent or guardian, whether, according to town records, the dog has been appropriately immunized against rabies. Thousands of people have lost millions of dollars and their personal information to tax scams. Scammers use the regular mail, telephone, or email to set up individuals, businesses, payroll and tax professionals. The IRS doesn't initiate contact with taxpayers by email, text messages or social media channels to request personal or financial information. Recognize the telltale signs of a scam. See also: How to know it’s really the IRS calling or knocking on your door. Do not give out personal information!! The Police Department has seen an uptick in Law Enforcement issues on Social Media – We ask you all to call the on-duty Officer at 228-0511, when you are suspicious of anything or anyone. If a crime has been committed, please call us! Chief Lougee attended a presentation by Shannon Desilets, Program Coordinator for the State of NH at the Bow High School for Administrators. The Choose Love Formula teaches the foundation concepts and skills of social and emotional learning (SEL), and is informed by current brain research and neuroscience. The goal of the Choose Love Enrichment ProgramTM is to provide parents & children with the knowledge, attitude, and skills they need to choose love in any situation. Go to: https://www.jesselewischooselove.org/about-us/ to view the at home and community programs. The School District is in discussion on how to implement it in our schools. Saturday, April 27 from 10:00 a.m. – 2:00 p.m, Bow Police will be hosting another annual Drug Take Back Day. Come to the Safety Center and turn in all your unused or expired prescription medication. As a reminder, the Department does have a drug box accessible 24/7 in the Foyer of the Safety Center if you cannot make it on April 27th. Beginning in the 1950s, due to concerns that people were listening to the radio more than they were reading, the National Library Association began promoting a celebration of libraries every April. This April is the 61st annual National Library Week. I remember the small public library from my childhood. My first memories are of my mom taking me and my siblings to the library every week to return a stack of picture books and check out the next stack of picture books. I remember having a hang up on thinking that I every week I needed to check out the same book Are You My Mother? by P.D. Eastman. But my memories of the library were not only about books. I can remember the library sponsoring a program where folks who were retired would set up tables with their hobbies and children could come and ask questions about the hobbies. From that event at the library and the kindness of one gentleman bringing his stamp collection to share, I began a stamp collection and even would go with my mother later to meet with him to ask questions and learn new collection techniques. It is this role of public libraries that we celebrate, the role of connecting people with new ideas, reliable information, and with each other. Please watch for the upcoming announcements for the summer programming at Baker Free Library and the ways the library can be a part of your family’s summer. Also this month, the Library Board of Trustees wanted to take this opportunity to thank outgoing chairperson, Christine Carey, for her service as Library Trustee. Christine has served the library with dedication, enthusiasm, and leadership during her five-year tenure as Library Trustee. It is community members like Christine who run for office and complete the obligations of their elected duties with passion and diligence that has contributed to the ongoing vibrancy of not only the Baker Free Library but also our community. We've added a few new streaming video resources for your use, Kanopy and rbDigital (which includes Acorn TV, IndieFlix, Stingray Quello, Great Courses, and Method Test Prep)! Access these resources using your library card through the Library's Catalog Page, or through our web site. There is a limit of six downloads per month for Kanopy, and 1 checkout per week for rbDigital (with a seven day pass to view that specific series/resource for that week's time). Note that for rbDigital, you'll need to use the first 13 digits of your library card to register. For more instructions on how to access these new services as well as our longstanding Hoopla and NH Downloadable Books services, please visit our Downloadables web page. Thanks to a grant obtained by SAU 67, both our library and the Dunbarton library have mobile hotspots for our patrons to borrow (must be 18 years old and up, but parents can borrow them for their child’s use)! These hotspots allow free Internet access from any location within the Sprint network, and there is no cost to borrow a hotspot. Because the funding for these hotspots came through an educational grant, there is filtering software and malware detection on them - no pornographic materials will be accessible. If you are interested in borrowing a hotspot, call the library at 224-7113 or email info@bakerfreelib.org. Due to a collaboration with Yoga NH, the library is pleased to offer FREE 1-hour yoga classes each month to Bow residents and library card holders! These classes are suitable for all levels, and the next classes will be held 9:00 a.m. to 10:00 a.m. on Sunday, April 28, 2019 and Saturday, May 4, 2019. New this year – non-Bow residents can attend for a fee of $12 per class. Pre-registration and payment is required through http://yoganh.com. We CANNOT accommodate drop-ins for non-Bow residents, so registration and payment is required prior to the class through the Yoga NH web site. Bow peeps can now have their non-Bow yoga friends take a class with them! The Friends of the Baker Free Library will hold their next donation day on Saturday, April 27, 2019, 10:00 a.m. to 2:00 p.m. Questions? Email info@bakerfreelib.org. The Baker Free Library Foundation has one director vacancy to fill. The Foundation raises and manages capital funds for the library's long-term stability in our community, as well as for special larger projects. Directors serve 3 year terms, and meet quarterly. If you are interested in helping your community through service on the Baker Free Library Foundation Board, please contact Mike Griffin, Foundation Treasurer, at mgriffin@crossagency.com, or Tom Ives, Foundation Director, at tei@nhbindery.com. Dog owners can register their dog(s) anytime between now and April 30, 2019 to avoid late fees. You can register your dog in person at the Town Clerk's Office, by mail, or online on the at the Town of Bow website. The Town Clerk's Office no longer sends out postcard reminders. If you have provided us with an email address you will receive a reminder from us each month. Please note late fees will start to accrue on June 1st. Failure to register your dog can result in a $25.00 penalty, plus late fees. Pinard Waste, the Town’s waste and recycling hauler, is working with the Solid Waste and Recycling Committee to come up with a modification of our current approach to recycling. The Town has allowed Pinard the flexibility to respond to market pressures accordingly, in keeping up with trying to find the best solution. Pinard will be conducting a trial over the next few weeks that will involve using one truck to remove the solid waste and recycling carts. The trial is being run to see what cost savings the Town may realize, until the market for recyclables stabilizes and we can continue the recycling program. An informational article from the Committee is posted on the Town’s website (Recycling article). The article contains links to valuable information as to steps that recyclers can take to help to bring the market back. These include better cleaning, and sorting, of recyclables by residents. Please contact the Town Manager’s office with any questions that you may have. Together, we can do this.